We work with diverse range of industries. Our work reflects our clients’ perception. In the sector of hostel, it’s significant to impress visitors with engaging and informative content along with pictures of the rooms. You’re doing so for self-differentiating yourself and to stand out in the competition. Dwivedi Luxury Hotels deal offer fully-equipped AC private rooms to enhance the staying experience of the travelers at pocket-friendly prices in Thailand. They approached us to design their website to drive in more guests and hence, more sales. Whereas many hostels cater to the pleasure-loving traveler, the anxiety of user brings down the sales funnel. Tourists need to stay somewhere that’s secured, ensures comfort, and is accessible. Managing the website by putting informative and proper content to accommodate global clients with different languages was the challenge for us. Instead of displaying some fake pictures on the website, we had to provide required information along with real images. Today, approximately 40% of the travelers personalize their trip by staying in hostels that are budget-friendly and fulfill all the necessary requirements. We have re-organized images and provide more compelling content to draw in huge visitors through the newly designed website. An interactive ‘Maps and Directions’ section was also included to show you the main points of interest where they can spend time leisurely. When someone ‘dares the world to save the planet’, we love to help them in their endeavor. How? Of course, by offering them strategic marketing solutions. That’s why, we have come up as a friend to OldCar company. Providing the services often come with challenges. Our team was completely ready to overcome the challenges with their creativity. Let’s read how we had done that. The objective of OldCar was to recycle the junk cars. As they were doing something innovative, understanding their business fully was key to designing their website. Prior to website designing and developing, observing what their peers are doing was a big challenge for us. Another challenge we face while working on the project is following the trend in website designing of a company of this niche. Through in-depth research and knowledge, we attempted to give them an engaging, easy-to navigate, and responsive website. Identified the Targeted Audience: As the company deals with cars, we have to design the website in a way that it will engage the targeted audiences. Framed Designing Strategy: We analyze the business to frame strategies of how to create interesting and SEO-friendly website. Designed the Website: Simple website that can convey the message of the business properly is what we’ve designed for them. Now, they are enjoying huge ROI by getting customers through their website. Over the last 34 years, Bhagchandka is engaged in exporting agro products, ferro alloys and semi-finished products. They aim to bring a taste to the dining of not only Indian families but also to abroad countries. Bhagchandka Exports contacted 4Source to assist them in reaching huge audiences online by designing a user-friendly website for them. To drive sales-in store, we had to design a website for them that will give all the necessary information. Winning customers’ trust through this newly designed website was a challenge for us. Everything from designing to content, had to be up to the mark. Our team burn their midnight oil to do extensive research about the exporting industry. Shoppers are doubtful while buying agro and frozen products. They doubt whether it will be fresh and free of harmful chemicals. They’re also price sensitive yet are ready to pay huge bucks in getting the authentic items. We used the authenticity and quality insights to develop an engaging website that will surely catch readers’ attention. One of the main touch point of customers is packaging. We rack brains and use images and content to point out the fact that they are delivering fresh products through hygienic packaging. With lots of studies, we ultimately found out how the targeted audience can be hit through news and events, describing the products, etc. Today, online presence has become the lifeline of all businesses. And that’s where the significance of a SEO-friendly website comes. Giving high quality hair and beauty services is the objective of De Mask Lifestyle. As it was a budding company, so getting a dominant position in the crowded beauty industry was bit tough. However, we’ve helped them with effective digital solutions. We thought to discuss with you the challenges we’ve faced during the journey and how we’ve won it eventually. We had to show our creativity while giving credibility to this new brand. Before designing their website, our team conducted a lot of study and survey the beauty industry thoroughly. For promoting the company offline, we have designed flyers, leaflets, standee, and posters too. All of these jobs were challenges to us which we overcame successfully. When it comes to picking beauty services, people become choosy. They want to get standard service. So, we had to draw a picture where we can prioritize quality. It is from there we can gain the trust of the customers. 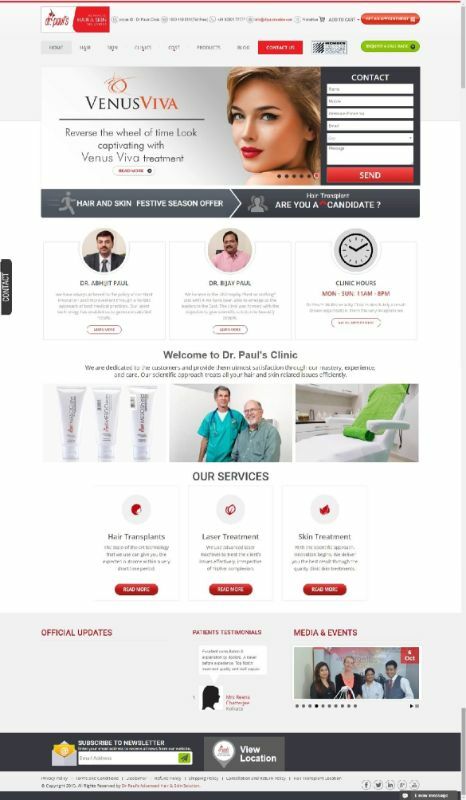 With result-oriented marketing strategies, we designed their website. Our designers, developers, and content writers worked hard to give them a responsive and engaging website. Exploration of hidden magical beauty gets easier to have with unique and inexpensive aesthetic solutions. Dr. Paul’s Advanced Hair and Skin Solutions is an ISO 9001 and 14001 certified organization. Its journey began in the year 2007 and presently, several clinics have been spread all over India. The brand is intended to offer outstanding hair and solutions at affordable ranges. This is a well acknowledged and international standard brand name in the aesthetic world and the main purpose of the medical professionals of this company is to offer value-driven solutions for different skin and hair related issues. Cutting-edge technologies along with the incredible tools have been used to offer the greatest ever services. Promoting the enterprise and increasing the brand’s visibility were of huge significance. To inform the target customers about the important and relevant details of the company is considered to be essential enough for effective marketing and this case was not an exception to it at all. The major requirement was to get connected with ample number of consumers with ease and the strategies of Four Source Technologies have totally been successful in this case. We at Four Source Technologies analyze and apprehend the requirements of the company and after apprehending the noteworthy necessities, we have planned a user-friendly website. In addition, we have offered them result-driven Digital Marketing Solutions that included proper keyword research and analysis, effectual content marketing and so on. Our expert and dynamic team members have handled their social media platforms to an extent so that maximum number of audiences can get notified about their updates. We have been successful to make their customers engaged to the respective social networking pages by offering unique social media marketing service. Not just that but also our professionals were involved in arranging social media campaigns for enhancing the recognition of this business. Since its establishment in 1992, Safari Tours Inc. has remained one of the biggest and reliable travelling agencies throughout Miami. From almost all hotels of Downtown Miami, South Beach, and Hollywood, they pick passengers and make them see the numerous tourist spots of Miami, Bahamas, Key West, and Orlando. As they have bilingual tourist guides, understanding the stories associated with the spots are not uphill battles, which further enhance their travelling experience. Being an insured and licensed company, they ensure a safe journey. The customer Safari Tours Inc. has gained over years is due to the detailed tours they provide at competitive packages. Professionals of the company work with the objective of quenching the wanderlust thirst. Before conducting tours, they educate themselves about the place well so as to make sure that the travelers are not missing a single piece of fun while travelling. Customers are their base. Hence, they give all efforts in promoting their business online to hit their target audience. To reach the common mass, Safari Tours Inc. emphasizes on website development. The experts of 4Source Technologies came up with an effective and user-friendly website for them. Their designed website looks perfect on all kinds of devices. Besides, the services the company provides are also mentioned in detail. Bringing Aspiration to Reality, IST’s main motto is to impart quality education for nation’s betterment. Institute of Science and Technology, a self-financing Engineering and Management college, sponsored by Gopsai Avinandan Sangha started its journey in 2005. Since then, its aphorism is to impart value-based education to the learners who are going to be the future of the nation. It is approved by AICTE, New Delhi and presently affiliated to the MAKAUT & WBSCTVESD. Providing all sorts of amenities to ease the process of learning is what IST aims at. All the staffs as well as the faculty members are bound to stand in the favor of the educatees. All types of facilities including the boarding facility are provided under one roof to help out the pupils. The plan of action for IST has always been conveying the best ever education and hence, the requirement is to reach students and make them understand about the course of study. The way of edification and other associated processes must be thoroughly apprehended by the willing pupils and keeping these factors in mind, the experts of Four Source Technologies have assisted the college to gain more visibility. A user-friendly website is designed and developed by the expert and adept professionals of Four Source Technologies. Besides, astounding Digital Marketing Solutions have been proffered at a cost-effective range so that a great many students can avail significant information about the college and take relevant decisions to set up their career. KEPRO Tools & Equipment's Pvt. Ltd.
Fortified lifting and welding with robust and durable equipment. With a view to help out different Indian industries, KEPRO Tools & Equipments Pvt. Ltd. Was established in 1999, under Companies Act, 1956. This ISO 9001 accredited company has been popular for offering a wide range of properly tested and hence, safe and strong lifting and welding tools to several Indian industries for more than 16 years. Besides having registered office at Kolkata, Kepro has associates at Haridwar, Delhi and Ahmedabad. In addition, they have more than 100 dealers and distributors throughout India and they serve various users maintaining proper punctuality. The customers that Kepro work for include Steel and Power Plants, Aluminium & Copper Plants, Atomic Power Plants, CoalBelds, Electricity Boards, Mining Sectors, Oil Refineries, Port Trust, Infrastructure Industries, Dockyards, Indian Defence Services, etc. Their primary requisite is to keep hold on their reputation through their high-end services. They intend to manage and maintain strong and cordial terms with the discerning clients by making them utterly pleased and satisfied. The first and foremost agenda for the business was to get digital so that the users can get relevant information about their tools and services without facing any hurdle. They were likely to provide all the necessary details about their equipment that they deal in. Keeping in mind the necessities of Kepro, the experts of Four Source Technologies have offered them an outstanding solution by proffering convenient website at affordable cost. Not just that but also the site will look and function properly on every type of devices. Their site enlists all the products along with major specifications. These are nevertheless going to be advantageous for their esteemed customers. Superior standard lift support with quality assurance. Shahi Engineering Works is an acknowledged elevator and escalator service provider of India. They provide quality products and effectual customer support to their users. Robust and durable products are offered from their end at an affordable rate to satisfy the customers. The standard of their work has already fetched popularity for them and after serving for several years, it has become the multinational elevator products supplier. They have a prestigious clientele base throughout India for whom they deliver top-notch escalator and elevator services. Adept and skilled technical professionals along with experienced designers are there to take complete control over different projects. Being a leading provider of value-driven elevator and escalator services, the chief and major concern of Shahi Engineering Works is to preserve their position. To show their development and prosperity and reaching clients with ease, they were in a great need of an impeccable website utilizing which they could be capable of doing their business flawlessly. Four Source Technologies after apprehending its requirement has provided cost-effective solutions that included their website and logo. The site consists of significant details about their products. Apart from these, contact details are also provided for which the users don’t have to face trouble in locating them out. Besides, the site visitors can be directly linked to their social media sites with just a simple click. Rajshree Recycling Metals Pvt. Ltd. Authentic and state-of-the-art car scraping solutions in a cost-effective way. Rajshree Recycling Metals Private Limited is the first ever company in India that has been dealing in car scrapping. Their working area presently includes Kolkata and Mumbai and they are soon going to be accessible at Pune, Bangalore, Chennai, and Delhi. They even have their own yard for processing the spare and unnecessary parts of the cars that are basically older than 15 years and quite obviously, don’t be in a condition to run on the road. The services that they offer to their clients are absolutely authentic as proper paperwork is done beforehand. They also have set up a modern plant that’s needful to prepare shredder scrap from the car’s structure. However, the car recycling procedure is value-driven as the scrap metals get utilized in the iron and steel industry. Not many people are aware of the facts of car scrapping and recycling and hence, the primary requisite of RR Metals was to make people conscious about the whole process and its significance. To make this happen, what they needed was a website through which a huge number of individuals can gather relevant information on them. The dynamic team members of Four Source Technologies have given RR Metals a perfect solution by creating user-friendly as well as bespoken website. In addition to this, an astounding logo has been delivered and it perfectly relates to their brand. Every sort of detail including their style of working and contact is mentioned on the site to help out the visitors. AKS or Anand Kumar Singhania is a renowned name in the construction field. Since its inception in 2011, the highly skilled team of the company is offering unparalleled works by using their in-depth knowledge and advanced technology. The wide range of services they offer is inclusive of building construction, transportation, boundary walls construction, road construction, and many more. For the flawless execution of the projects they handle, the team members share good equation with each other. Till date, AKS has worked for some of the reputed companies like Bharat Heavy Electricals Limited, ONGC, Vizag Steel, L&T, and many more. The company intends to strengthen their online reputation further so as to reach the huge mass. By working on projects of big shots, they aim at propagating their name in the near future. However, to do that effectively, they need to create brand awareness and promote their online business simultaneously. With utmost proficiency, the pool of talents of 4Source Technologies designed the website of AKS Construction Site. The website they design not only looks appealing but also enhances the user’s experience. While designing, the professionals follow the trends while conveying the message of the website clearly. All the major specifications along with the projects handled by them are mentioned there to give the viewers a better idea of the company.